Croaking Hospital is the penultimate level of the game. The helicopter pad is located near to the bottom right door of the opening building. The asymmetric layout can create difficulties designing an efficient hospital. This level can be completed with only purchasing the 4 leftmost buidlings. This is sufficient space to place one of everything required. Initial construction can focus on either the top, or bottom, 2 buildings. Diagnostic rooms, plus a GP, can be placed in the top middle building, with clinics and surgical area in the top left building. When more diagnostic and clinic rooms have been researched, the opposite two buidlings can be purchased. The initial GP area can be in the central building. At the point where the room widens, both top and bottom areas are suitable for GP rooms with individual seating areas for each. 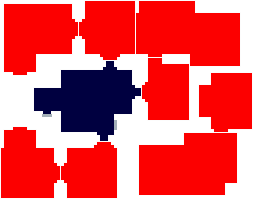 4 GP rooms will be required for later on, but 2(one above, one below) would be more than sufficient for the early phases. The central building can be also used for training, research and a staff room. This page was last edited on 19 October 2016, at 14:31. This page has been accessed 23,376 times.